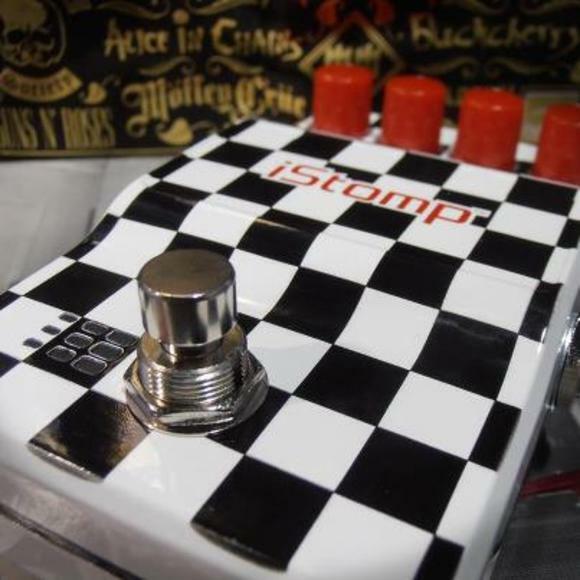 SALT LAKE CITY, Utah – HARMAN’s DigiTech today announced that its limited edition Vans Warped Tour iStomp downloadable pedal is now available exclusively on the Vans Warped Tour 2012. Featuring an eye-popping black and white checkerboard finish inspired by classic old-school Vans shoes, the pedal is available only at tour venues. The 2012 Warped Tour will feature over 80 bands performing at various venues from now through August 5. Festival-goers will be able to try out and purchase the limited edition Vans Warped Tour iStomp at DigiTech’s interactive demo stations that will be onsite for all 41 of the tour’s stops across the country. DigiTech clinicians will also be on hand to demonstrate some of the latest products including the Vans Warped Tour iStomp, new Whammy™ pitch-shifting pedal and iPB-10 programmable pedalboard for iPad. In partnership with The Warped Tour, DigiTech will also sponsor band signings and acoustic segments on the DigiTech truck’s stage. Bands on the tour include Mayday Parade, Taking Back Sunday, Yellowcard, The Used, New Found Glory, We The Kings, Streetlight Manifesto, Dead Sara, Of Mice and Men, Miss May I and many more. The DigiTech iStomp is an entirely new concept in guitar stompboxes that allows musicians to turn the iStomp into any pedal in the Stomp Shop online pedal store. Offering almost limitless sonic possibilities, the iStomp connects to an Apple iOS device where musicians can use the Stomp Shop app to load it with the e-pedal of their choice. The Stomp Shop is free app and comes with two of the most popular requested pedals, the DigiTech Total Recall Delay™ and the DigiTech Redline Overdrive™. It also gives access to additional pedals that musicians can browse, try out and purchase. With the iStomp and the Stomp Shop, DigiTech can deliver an ever-expanding array of exciting new pedals to guitar players worldwide. The DigiTech Vans Warped Tour iStomp is currently available at $179.95 suggested retail.